So, you are driving down I-10 when your car starts shaking in the front, the steering wheel gets harder to turn, and the car is veering into the shoulder. You have a flat tire. Using caution, you ease off the gas and gradually stop on the shoulder. At least you have a tool kit. You begin loosening the lug nuts, jacking the car up, pulling the lug nuts off, removing the flat, and mounting the spare. All of these are actions you hopefully never have to perform. 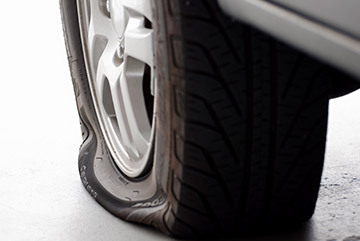 Regardless, a flat tire will need to be repaired or replaced depending on the damage. Chabill’s Tire & Auto Service stocks and maintains 17 locations with the understanding that picking the right tire can be a difficult, time-consuming process. Find the right tires and prices at Chabill’s Tire & Auto Service! Why Chabill’s Tire & Auto Service? Chabill's Tire & Auto Service has 17 convenient locations across Baton Rouge, Lafayette, Morgan City and the surrounding areas. Our shops offer the best pricing to get a flat tire fixed and our certified technicians are experts at fixing tires in a jiffy! Call us today or schedule your appointment online in conjunction with your other auto repair services at one of our multiple locations. Chabill's Tire & Auto Service is proud to be the local auto repair shop and provider of tires nearest to you with quality services and great prices!